I had some beautiful acorn squash from our local CSA. This was so much fun, both to make and to eat. It is actually fairly healthy, but feels very decadent. Must be the phyllo dough. Split the acorn squash in half, scoop out the strings and seeds, and put the halves in a glass baking dish. Drizzle with olive oil and a little salt and pepper, then either bake in a 350°F oven for about 50 minutes, or in a microwave for about 20 minutes, until the flesh is very soft and can be removed from the skin with a fork. Scrape the acorn squash out of its skin and mash very well with a fork. Squeeze the garlic out of out of the cloves and mash. Put the garlic in a large frying pan over medium heat and add the sage leaves. Fry until fragrant, then add the acorn squash and cook until squash is warmed through. Set aside until slightly cooled. In a large bowl, combine the cooked squash and garlic with the nutmeg, ricotta, and pinenuts. Stir well and taste. Add more salt and pepper if it needs it. Preheat the oven to 400°F. Melt the butter in a small bowl and add the olive oil. 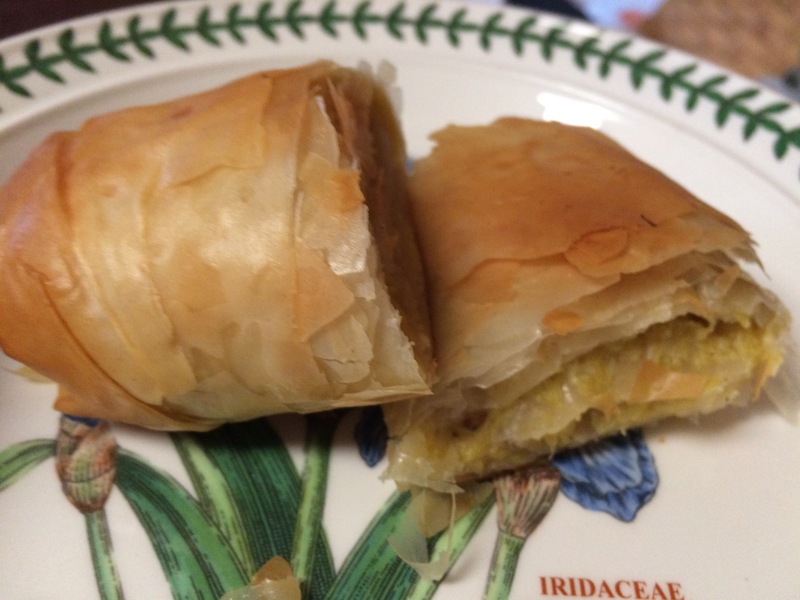 On a large piece of wax paper, lay out your first sheet of phyllo dough. Brush it with the butter, then stack another sheet on top. Repeat until you have about 10 layers (you can use less). Spread about a third of the squash mixture over the sheet of phyllo, leaving an inch of room at the edges. Roll up from the long side, tucking the ends in. Pick up the wax paper and carefully roll the strudel off the paper and on to a large baking sheet. Repeat to make two more strudels. Bake for about 20 minutes, or until they are golden and crispy. Cut into slice and serve right away. Or, if these have to wait a little, you can re-crisp them in the oven at 400°F. Enjoy! Makes 3 strudels, or 18-24 slices. 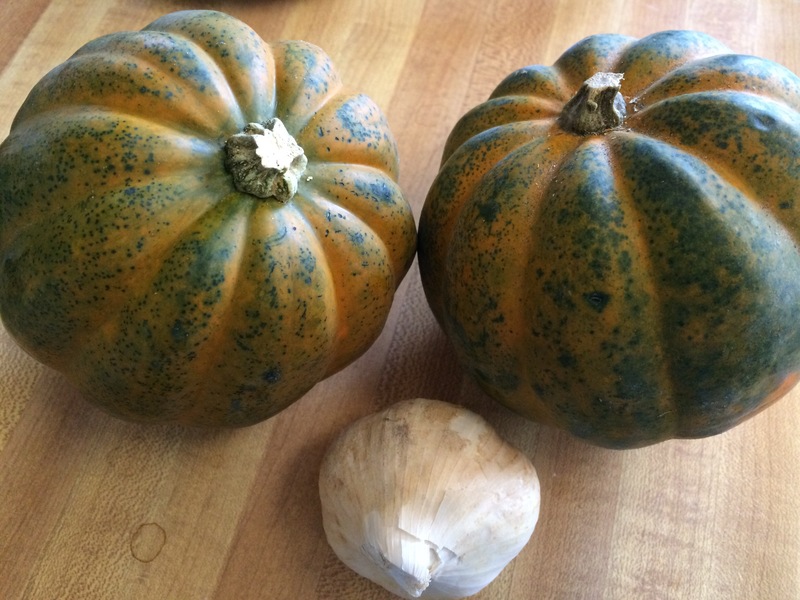 Funny, it was just yesterday I saw this squash in supermarket and I was thinking how people use it….thanks for the recipe. I am glad it was as so timely. Let me know if you try it.